Well, it is nearing the end of kiteboarding season in the northern latitudes, so what's a guy to do? Why, go power kiting of course. A lot of people have been mesmerized by the dream of kitesurfing while missing out on the early aspects of power kites. Now is a great time to drift back to those roots and have a ball with a great big fat power kite. Sure, you can use your leading edge inflatable kite, but the risk of destruction on the pavement or sharp objects is a pretty scary proposition. So now you need to decide, "what kind of inflatable do I want?" Simple power kite or trainer kite with no depower- Well, if you really want to get ripped around you will need a kite in the 4-5 meter range, and that won't give you much more than a half hour at a time due to fatigue. You can use one, but expect your sessions to drop off by quite a large margin. Depowerable foil (Is depowerable a word? It should be.) This is a really good way to go. With a kite like the HQ Apex going for $600-800 complete, you can really have a high performance all-use power kite. 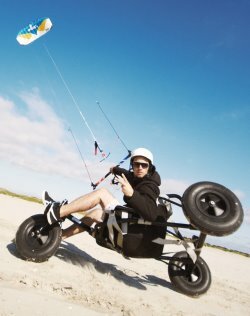 The Apex or a similar high depower foil will give you loads of options from the kite buggy, land board, snow board, skate board or even just getting dragged across the field. The great thing about a kite like this is that your sessions are really long since you are using your kiteboarding harness instead of your arms to take the pull, and the kites are incredibly rugged to withstand most of the punishment you can dish out. 4 line kites with handles - I love this setup since it allows maximum use of your kite in many wind conditions. A kite on handles will give you about 25% more control over a high de- power kite since you can change each side of your kite wing's pitch. It is great when the kite begins to overshoot the wind window and you simply back your power kite back into the window. This is a really great feature on a fast-moving buggy or skis. I also like the fact that you can fly really short lines and have much more control. Check out the HQ Beamer or Prism Tensor power kites for maximum control and fun with 4 lines and handles. If you set up your handles correctly with a center strap you can also hook in to maximize your riding time - beware - no quick release here. Handles will take some time to get used to, so go play in some light winds and learn some of the secrets before you go ramp it up. So now that you are waiting for the snow and the water/air combo is getting really cold, jump onto some old school fun, grab a landboard or buggy, and rip up your local parking lot, beach or field.